A timely tale from close to home. 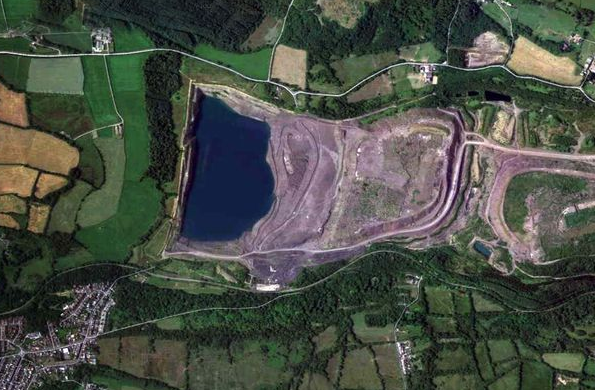 Today saw a special meeting of Bridgend CBC’s Planning Committee to discuss the mess (both figuratively and literally) that is the former Margam/Parc Slip opencast site, just outside Bridgend. Oggy Bloggy Ogwr covers the saga well, but things are coming to something of a head. The two relevant councils , BCBC and NPTCBC, have long since given up on seeing Celtic Energy restore the site fully, as was a condition of their planning consents, in no small part because of Caerphilly-based Celtic Energy pulling that classic capitalist con trick of transferring ownership of the sites to a transferred ownership of the opencast sites to a British Virgin Islands registered subsidiaries, namely Oak Regeneration, Pine Regeneration, Beech Regeneration and Ash Regeneration, none of which appear to have the assets required for restoration. Five senior executives at Celtic Energy walked away with benefits worth more than £10m… according to George Monbiot. Oak Regeneration (etc.) have proven typically slippery customers. With inadequate assets to do the work, they tried ‘twisting the arms’ of planners to grant them more opencast licences (towards Pencoed I believe) to pay for the work. Both councils fanned about, not attempting to enforce conditions straight after mining stopped and giving Oak encouragement to squirm further. This squirming eventually led to attempted fraud charges being levelled and then dropped for lack of evidence, but the overall picture remained much the same – the company only had £8m to its name to do work expected to cost £157m. Thus we have something of an impasse. Any attempt to enforce compliance on Oak Regeneration will bankrupt it and under the Tory-inspired planning system, the corporate bosses walk away scot-free, while our Councils and Wales Government are left to pick up the pieces and do the work from public money. Plaid Cymru AM, Bethan Jenkins, has been at the forefront of attempts to raise this issue in the Senedd. Labour minister, Carl Sargeant has been just as evasive and ‘careful’ in his language over this issue as he has over fracking – i.e. uninspiring and untrustworthy. Carwyn Jones has had notably little to say – even though it impacts on his constituency. So where do we find ourselves today? The most pressing issue regards the 600 by 400 metre water-filled hole, up to 108 metres deep in places. “It predicts within 2 hours of a breach, 1.75 million cubic metres of water would flow into the River Kenfig, resulting in floods – between 2 metres (6’6”) and 4 metres (13′) deep in some areas – downstream at the Crown Road area of Kenfig Hill, North Cornelly and the Kenfig Industrial Estate which would be, in the report’s own words, “potentially catastrophic and life threatening”. The only plan on the table from Celtic/Oak involves using an overflow channel to slowly drain this lake into the River Kenfig. It is just about the only option within Oak’s manipulated budget. But having seen the water in Ffos-y-fran this week, that is a scary enough proposition within costly monitoring and remedying of water quality going into a river that flows into the Kenfig National Nature Reserve!! The interesting development this week, again echoing the fracking issue, is that apparently a request has been made for the application(s) to be “called-in”. That means a full public inquiry could be held, while the incoming Welsh Government minister (please, please, not Sergeant!) with responsibility for planning would decide the application themselves. It is to be hoped that the next Wales Bill will devolve sufficient autonomy to Wales Government to allow them to address this wilful dodging of responsibility. Only when directors are held personally liable for the decisions they take on behalf of their corporations are we going to see these appalling attitudes change. This entry was posted in Uncategorized on May 4, 2016 by Bridgend's Green Leftie.